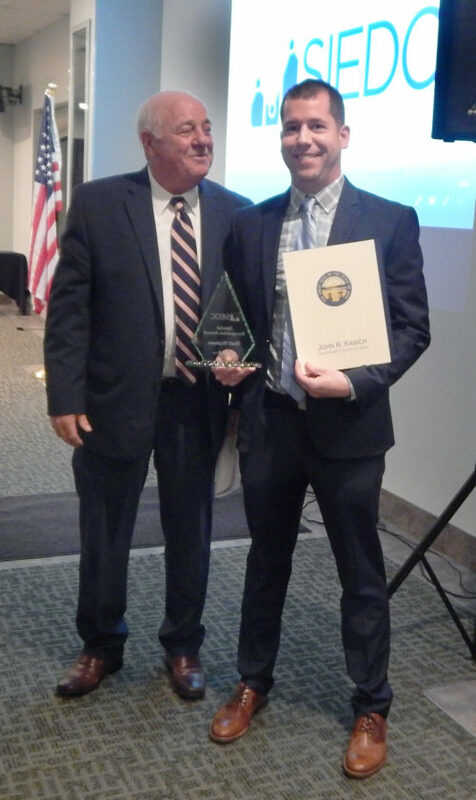 PHOTO BY JIMMY FLINT Tiffin Assistant Engineer Matt Watson (right) receives the Special Recognition Award from Seneca County Commissioner Mike Kerschner at SIEDC’s annual meeting Thursday night at Camden Falls Conference Center. Seneca Industrial and Economic Development Corp. President and CEO David Zak answered a year-old question at Thursday night’s SIEDC annual meeting and dinner. Zak, who was dealing with the recent loss of his father at the time, asked attendees at last year’s meeting what they wanted to do before they die. This year, he reflected on the people who have died in the past couple years and said the question remains important. To answer the question, Zak quoted philosopher William James. “The greatest use of life is to spend it on something that will outlast it,” he quoted. “If what we’re seeing in Tiffin and Seneca County continues, we’re going to do that,” he said. Zak and other SIEDC staff reflected on 2017 and offered an idea of what to expect this year. He said 88 projects were tracked by SIEDC in 2017 and they resulted in 200 new jobs and $64 million of investment. He said four-year totals are 400 projects, 1,400 new jobs and about $335 million of investment. Zak said SIEDC and local officials hope to leave a legacy of collaboration. Among his highlights were the East Green complex, a 60-acre commercial development near Mercy Health – Tiffin Hospital and a speculative building being constructed at Eagle Rock Business Park. Reinhart announced the expansion of Tiffin’s Community Block Grant-funded Facade Enhancement Program. She said the expansion is to include more downtown buildings and apply to a wider variety of projects. Eligible projects now will not be limited to the facade on the front of buildings. Improvements allowed by the program include awnings, window and door repair, painting of already painted surfaces, tuck pointing, signage, roofing, repair or replacement of furnaces and HVAC units, electrical upgrades and plumbing, handicap accessibility and structural updates. She said since 2014, the program has awarded 58 projects and has brought a total investment of about $1.7 million into downtown. Reinhart said 10 businesses opened downtown in 2017, after 11 opened in 2016. She said three businesses already had opened downtown this year. Another set to open soon is The Chandelier, an event center located in the former Community Civic Center. Reinhart said a record $5.1 million was invested in downtown Tiffin in 2017, creating 41 new jobs. Riggs highlighted several ongoing projects and announced the opening of a new business. Riggs said Spire Advertising, one of the fastest growing advertising firms in Northeast Ohio, is to open a satellite office in the same complex as SIEDC, 19 W. Market St., Ste. E.
He said the Ashland-based company specializes in working with small business owners to create content, design websites and tailor sales and marketing software. According to a release, Spire owner and founder Jeremy Harrison grew up in Seneca County and attended Heidelberg University before moving to Ashland and opening the business in 2006. Spire offers free seminars to small businesses on topics including time efficiency, growing sales and hiring and retaining employees. It is to open this spring. Lang gave statistics regarding the organization’s website and social media. success.wordpress.com, had 73,000 views on 86 posts. Lang said last year 230 Facebook posts had about 1.5 million impressions, the amount of times a post is on someone’s screen. • The President’s Award was given to Andrew and Cindy Kalnow. Andrew Kalnow is owner of National Machinery Co. and has had an impact with investments in several downtown projects including The Empire at 138 and the East Green complex. Previous recipients include Tiffin Mayor Aaron Montz, Tiffin City Councilman Rich Focht and Heidelberg University President Rob Huntington. • The Partnership in Development Award was presented to Suzie Reineke and Weston Reinbolt for helping redevelop several apartments and for investing in The Renaissance of Tiffin, a new bourbon bar at 129 S. Washington St.
• The Economic Development Award was presented to Zach Arnold, founder and owner of Arnold Machine. • The Entrepreneurial Spirit Award was presented to Ralph and Julie Smothers, owners of Ralph’s Joy of Living. • The Outstanding Business Award was presented to Rich Zeis Jr., of Zies Companies. • The Lifetime Achievement Award was presented to Tom Boes, co-owner of New Riegel Cafe. • The Special Recognition Award was presented to Tiffin Assistant Engineer Matt Watson.